UpFront with NGS: Get Ready for the New Who Do You Think You Are? Television Series! Get Ready for the New Who Do You Think You Are? Television Series! Stock up on the popcorn and get ready for the new NBC hit show Who Do You Think You Are? The family history-focused series will lead seven celebrities on a heart-warming journey back in time as they discover more about the ancestors who came before them. Lisa Kudrow, who executive produced the show, will be featured in the episodes, along with Sarah Jessica Parker, Spike Lee, Matthew Broderick, Susan Sarandon, Emmitt Smith, and Brooke Shields. Ancestry.com is a partner with NBC on the show. What is wonderful about the show is that, with the celebrity appeal, the genuine emotion they experience, and the family storytelling nature of the show, Who Do You Think You Are? is perfectly poised to appeal to the masses – not just professional genealogists or family history experts. Who Do You Think You Are? presents the genealogy community with a golden opportunity to grow and strengthen societies, to infuse our industry with younger audiences who can become the next generation of family historians, and to educate the public about how to successfully research their heritage. Really, this show presents the community with the opportunity to revolutionize, reshape, and redefine family history as a whole. * Post flyers, wallpaper, and more. 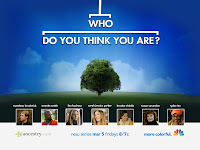 Ancestry.com just launched a web page (www.ancestry.com/spreadtheword) that includes downloadable flyers, computer wallpaper, and other ideas that everyone can use to help tell their society members, institution patrons, friends, co-workers and more about this new television show. * Share the Who Do You Think You Are? trailer. Consider posting a link to one of the Who Do You Think You Are? trailers on your society’s Facebook page, Twitter account, or website. * Send an email to others. Email the trailer to other society members, friends, or family. In fact, the Spread the Word page (www.ancestry.com/spreadtheword) has a pass-along email with a video that includes the trailer and Lisa Kudrow talking about what prompted her to produce the series. So spread the word – and don’t for get to tune in to NBC on Fridays beginning March 5 at 8/7c.